When I was participating in my first NaPoWriMo last April, I think there were several factors in why I didn't write a poem a day. I didn't stick to a schedule, I allowed myself to get distracted, and I don't think I was really prepared for a poetry writing challenge. It had been so long since I had written poetry on a regular basis I didn't even know what kind of poetry I wanted to write. This time I am going to have a plan and I am going to share that plan with you one tip at a time during our count down to the OctPoWriMo challenge. Tip One: Figure out what kind of poetry you want to write or if you want to explore more than one type. I found this fascinating site Shadow Poetry that has quite an expansive list of types of poetry and examples. Unfortunately this site will be closing on September 31, 2012 so I recommend you check it out before then. This will be my first step to exploring what type I want to write for this round of a poetry writing challenge. I'm glad you found it helpful. The really good news is I had emailed asking them to at least leave the site up until the end of October. When they responded they let me know they had decided to leave the resources up indefinitely. Yay! Thanks for stopping by and sharing word love! 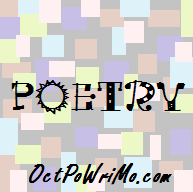 I hope you decide to join us for #OctPoWriMo in October. Morgan! This is awesome news!!! Of course I'm doing everything last minute and I'm hoping to participate in octpowrimo. When I showed my hubby (HS English teacher) this resource he wanted the details immediately. We were about to start printing like crazy thinking the site would be gone in a couple of hours! !